The tradition of singing along with holiday carols will begin Kellogg Community College’s Branch County Community Chorus’ 14th annual “Sounds of the Season” concert at 7:30 p.m. Saturday, Dec. 1. 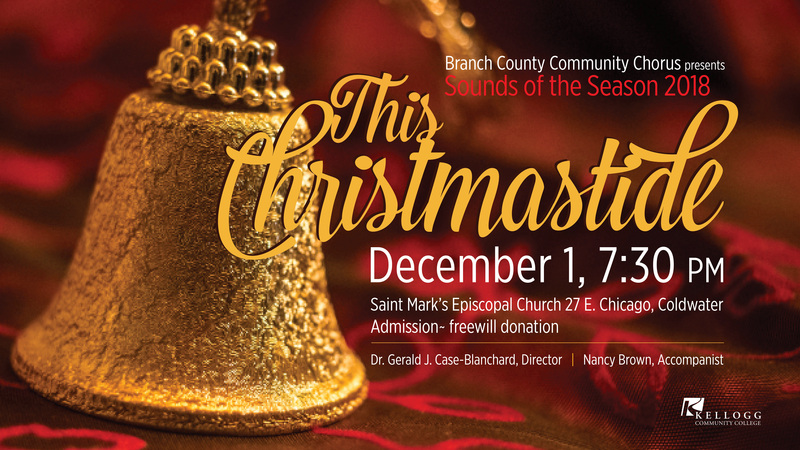 The free concert will be at St. Mark’s Episcopal Church, 27 E. Chicago St., Coldwater. After the sing-along, the concert program will feature a wide variety of seasonal favorites, including G. F. Handel’s “Hallelujah Chorus,” Jan Sweelinck’s “Hodie Christus Natus Est,” Donald Fraser’s “This Christmastide (Jessye’s Carol),” Marti Lantz and Lois Brownsey’s jazz classic “Holiday Swing” and Dave Maddux’s “Joy” from the film “The Preacher’s Wife,” and some musical surprises. Along with the Branch County Community Chorus, the Kellog Singers and the KCC Choral Union will perform, as will special guest ensembles the Bel Canto Singers and the Branch United Youth Chorus. Donations will be accepted at the concert. For more information about this concert or other KCC music programs, visit www.kellogg.edu/music or contact KCC Music Area Coordinator and Director of Music Dr. Gerald Case-Blanchard at blanchardg@kellogg.edu or 269-565-7859.